the bathroom is one of the busiest rooms in the house. Let’s face it, the bathroom is one of the busiest rooms in the house. This is especially true if you have a growing family filled with teenagers. A bathroom remodel may include creating a larger space for the family to get ready for school and work. Remodeling a bathroom into a bigger space is a great way to add more room and possibly tone down the arguments often associated with those that share a bathroom. Creating a larger space may entail removing some walls or even raising the bathroom cabinets. If you don’t really have the room to create more space there are some bathroom remodel techniques that can make it look like you did. The grand illusion, or so it seems, is creating the look of more space with tile flooring patterns and colors. Black and white tile patterns have been used as flooring to create a space that looks much larger. Lumina Builders Inc features tile experts ready to remove your old bathroom flooring and install tile that creates an illusion of a larger space. In addition to black and white tile, colorful tile or marble tile adds a fresh and exciting look to the bathroom. 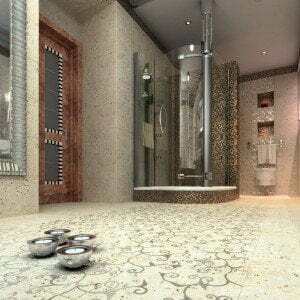 Walk In ShowersWith a variety of tile patterns and material available, it is important to select a tile setter that knows what they are doing. Lumina Builders Inc tile setters offer years of experience with tile. Any bathroom remodel will benefit from tile flooring. Contact us for a free on site consultation. We know that when the time comes to remodel a bathroom there are many decisions to be made. From choosing the flooring to deciding on what to do with the walls. Do you want to create a master bathroom that offers luxury? Perhaps it is time to upgrade the appliances to a modern style that adds a splash of excitement to the bathroom space. A bathroom remodel can be a fun project for all, that is, if done right. With a free in home consultation from Lumina Builders Inc, homeowners are afforded the opportunity to check out some exciting examples of some of our incredible bathroom transformations. We get it, there is a huge need to de-stress after a long day of work. 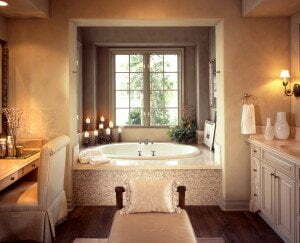 Luxury BathroomsOne of the top reasons for a bathroom remodel is to create a more relaxing space. Jacuzzi tubs and walk-in showers with tile walls are just a few of the ideas for a luxury bathroom remodel idea. The right lighting can set the mood too. Selecting warm tones for the bathroom can help with the feel of the bathroom. A Lumina Builders Inc representative is happy to schedule an appointment for a consultation. Home improvement is one of the best things a homeowner can do to keep up the home. Professional home remodeling by Lumina Builders Inc can transform the home from the inside out. Whether it is a bathroom remodel or a complete home makeover, we are with you from concept to completion.